Handle The handle of a table tennis bat marks the direct contact between the athlete and the sporting equipment. For this reason, it is very important that the handle exhibits a comfy and very pleasant feeling, since it provides feedback regarding the ball behavior when contacting the racket. This is achieved by various receptors located in the skin and hand, which provide important information with respect to the kind and intensity of pressures and movements. So if you bought (or if you are planning to buy) a paddle, please make sure to practice sufficiently. Just take the racket and do some exercises or a game to check whether the handle (and bat as a whole) might be too slippery, unstable or uncomfortable. Handles are commonly available in four different types: Straight, anatomical, flared, and conical. Most table tennis players prefer a flared handle. Head In most cases, the head of a table tennis paddle is made of wood. However, regulations also allow for some plastic or synthetic components. The wood is present in thin slices (also called plies, layers, or veneers), which are glued with each other. Harder (e.g. walnut, wenge, koto, mahogany, santos) and softer (balsa, lime, spruce, poplar, abachi) wood layers, being glued and combined, eventually result in the so called blade. Hardness and (mechanical) strength of the wood/blade considerably influence the ball behavior at and after ball-racket contact: Blades which are hard and of high strength are referred to as fast blades (intensive jump behavior of balls, fast balls). The opposite is present when using softer woods. The kind of woods/blades your are about to use, depends, hence, on your individual way of playing. This individual style will emerge over the years and will be mirrored using the right blade combinations. Rubbers First, a so called sponge material will be glued on top of the blade (outer veneer). The sponge material is basically a plastic, which is available in various thicknesses. On top of the sponge, the table tennis rubber (mostly a caoutchouc blend) is finally glued. In 1986, the ITTF (International Table Tennis Federation) declared that one side of the rubber must be red, the other side must be black colored. Just as the blades of a table tennis paddle are available in various designs, properties and thicknesses, so are the rubbers. Hence, the rubber considerably influences the behavior of the ball when it touches the racket. Regarding the basic structure, there is one thing in common among all TT rubbers: Either pimples in(wards), or pimples out(wards). Pimples in is the most common form: Thereby, pimples are glued in such a way that they are faced towards the sponge. The outer surface of the rubber (faced towards the ball) is flat and smooth. The material used as rubber is either natural rubber (very fast balls, but such rubbers exhibit less grip and less spin) or synthetic rubber (balls are slower, but the rubber surface has lots of grip and spin). For pimples out, quite solid and rigid natural rubber is used. Therefore, only little spin is possible due to its "harder" surface, and little grip. Especially beginners first have to learn many things: Basic techniques, such as spin, backspin, serves or blocks. They have to develop a feeling for the ball and for the whole table tennis sport, for coordination skills, and so forth. This means that beginners need a TT bat which is not purely designed for a defensive (Def), nor for an offensive (Off) game. It should be designed to allow for both styles, the golden mean so to speak. This kinds of TT rackets are called all-round (All). You can get those as all-blades, as well as all-rubbers. These are available as completely mounted paddles (completely assembled, for immediate use) or separately: In this case you order a blade plus two extra rubbers, just as you choose them (if you wish, we can deliver them finally assembled for immediate use, too!). A professional racket, commonly equipped with hard blades and fast rubbers for a fast offensive game, is not suitable for a beginner. This should be kept in mind. Instead, so called allround beginner products should be used. Caring, maintaining, and cleaning table tennis bats as well as rubbers is another important issue since they wear off in the course of time. During breaks and free periods of games etc., when the bat is in the bag or is becoming dusty in the shelf, protective foils may be placed on top of the TT rubbers. Furthermore, sprays for the rubber and tissues for the rubber / sponge are really worth it. Edge banding tapes, for example, protect the gluing and outer parts of the table tennis paddle. Of course, also table tennis tables are unavoidable in order to play. Although many coordination and warm-up exercises are conducted without a table, for real training sessions and competitions the table is a must-have. Theoretically speaking, any table would be ok for training purposes. 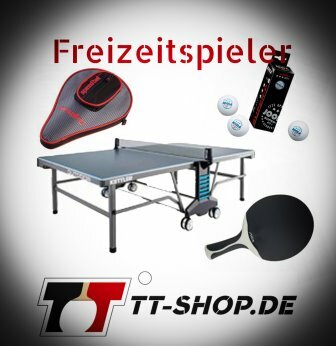 For official competitions, however, the table must be ITTF-licensed. Luckily, most tables are (recognizable by imprints or stickers). Some tables are even suitable for wheelchairs, since they offer a fair legroom. TT tables are commonly divided into indoor and outdoor use. Indoor tables should be protected from high humidity, direct contact with moisture or solar radiation. Well known brands are, for example, Joola, Andro, Donic, and Tibhar. (Indoor) Tables available today are –in most cases– of acceptable, good or very good quality. Commonly, the rack of the tables is powder-coated, varnished, and - hence - quite durable. Larger profiles and corresponding larger thicknesses result in a very good overall stability. An uneven ground can often be balanced by height-adjustable components. The whole table tennis table (or each half separately) is drivable by means of rollers. When folded into each other, some tables may be stored in a very space-saving way. Most tables exhibit many security features, and may be folded synchronically by one person only. Also a nice add on: Many tables are delivered in final assembly, they are hence ready to be used. But be careful: Often, no net is included! Also, because of their sophisticated technology and high degree of stability, they are quite heavy (sometimes way heavier than 100 kg). Usually, both plates of the table were coated several times (multi-coated), mostly they are scratch-proof, generally robust, and of blue or green coloration. One important parameter is the thickness of the plate, which varies between approx. 22 - 28 mm. Regarding the ball behavior, thicker plates are of higher quality, but also more expensive compared to thinner plates. The above mentioned rule also applies here: No ball, no game. However, ball does not equal ball. Every table tennis ball must exhibit certain measures and properties before officially being licensed for usage. Additionally, there were some changes regarding the regulations which balls may be used officially. In former times, all balls were made of celluloid. At the end of the 19th century, those celluloid balls were imported from the USA to e.g. Germany. Prior to this, balls were made of rubber or cork with a diameter of approx. 5 cm. Celluloid balls are produced by gluing two half-moulds using solvents, and heat exposure. Finally, they must fulfill strict criteria regarding many parameters, such as weight or circumference. However, the production process is very dangerous since celluloid is highly combustible. Also, there is a health risk due to the usage of solvents as adhesive material. For those reasons, the ITTF decided that as of 2014 the old celluloid ball may not be used anymore in many competitions. Instead, a new ball –the new plastic ball– must be used. The new plastic balls, also referred to as poly balls, are slightly bigger (diameter slightly larger than 40 mm) than the old celluloid balls (diameter slightly smaller than 40 mm). Plastic balls sound duller than celluloid balls, and they are less elastic at impact. For those reasons, also considering their bigger size, they are usually slower than celluloid balls. As already mentioned, all TT balls must fulfill strict criteria because equal conditions are very important in table tennis. Nevertheless, balls used for competitions are superior compared to balls used for training purposes. Balls for official competitions are of highest quality (so called 3-star balls). Both, 2- or 1-star balls, are of lower quality. Although those balls are superior compared to simple training balls, they are not licensed by the ITTF for official competitions. 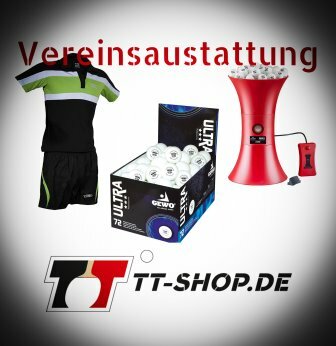 Training balls exhibit the lowest quality: They are commonly used for kids and beginners, however, not in the typical table tennis training. Instead, they are used in balance and coordinative tasks with the racket / paddle. Therefore, the use of training balls is absolutely justified and reasonable. Often, such balls are orange. Table tennis robots (or table tennis ball machines, also known as ping pong robots or machines) are a useful addition and complement to the regular training schedule. This is true for all levels, no matter if beginner or pro. Please note, however, that table tennis robots are an addition, not a substitution: Ball machines can never replace a real gaming partner or trainer. If, for example, you are dealing with techniques which require a high amount of repetitions, or if you want to optimize your rhythm ability, ping pong robots are a good choice. When using the robot also other advantages arise: For example, the trainer has sufficient time to watch you from all sides. Ball machines with recycling net system capture the returns and recycle the balls back to the robot to enable non-stop action. This is very demanding with respect to endurance. Ping pong robots consist of a control unit (for operation and settings of the ball machine), a head (serves the balls), a hopper for the balls, and (if present) a net to capture the returns or even a recycling system. The price for ping pong machines differs considerably, depending on possible features and settings: How easily can the TT robot be assembled and dismantled? What about the overall quality? What kind of spin, serving frequencies and so forth can be chosen? Well-known brands of table tennis robots are Tibhar, Donic, or Joola. Next to the already mentioned equipment, clothes play another important role in table tennis. Although layout and color are mostly kind of pre-set by the clubs, table tennis clothes should be comfy to wear. It is important to use materials which do not result in itch or even scratches of the skin. This should also be the case when sweating a lot. Speaking of sweating: Breathability and the ability to lead away the moisture is also very important in order to be able to cool down the body for one part. For the other part, the body should not cool off too much during rest. This is very similar with respect to shoes: They require a high degree of breathability in order to prevent (wet) sweaty feet. Additionally, high stability in all directions, good fit, low weight, and good grip on the ground are essential. One can see that accessories and equipment –just like bags or backpacks– are important in table tennis. Backpacks in table tennis (also available for women with narrower shoulder section and shorter back section) serve as adequate storage of bats, balls, clothes and foot/beverages. This is achieved by several compartments. Please watch out for sufficient padding at the back! This is also important when considering bags: Individual compartments to keep the overview and to prevent the rubbers from pressing against the shoes or other stiff items; material; size and capacity; length-adjustable straps; quality of seams/zippers; underbody protection; waterproofness; and many more things. They all are essential ingredients when buying a bag. We admit that there are many information at once. 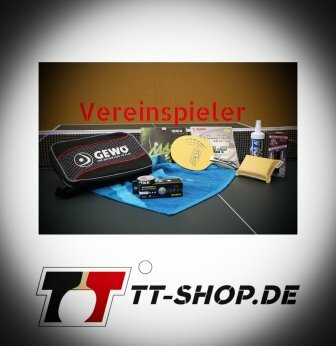 We really hoping that we provided you some basics what might be important to watch out for when buying accessories/equipment, and also that accessories have their place in table tennis. In case you have questions, please do not hesitate to contact us!